Seattle, Washington--(Newsfile Corp. - January 30, 2019) - CFN Media Group ("CFN Media"), the leading agency and financial media network dedicated to the North American cannabis industry, announces publication of an article discussing Cardiol Therapeutics' (TSX: CRDL) upcoming launch of its pharmaceutical CBD products, with the capacity to scale manufacturing to metric tonnes per year. In Canada, registered medical patients have been able to access cannabis-derived cannabidiol (CBD) oils since 2001, and the government's move to legalize cannabis in October 2018 opened the adult-use market. According to an article by CBC, the result has been a shortage of medicinal CBD, though opinions vary on exact reasons for the current lack of supply. According to James O'Hara, of the advocacy group Canadians for Fair Access to Medical Marijuana, "It's actually more than a supply issue. Really, it's something of a health crisis now. Unfortunately, there are no regulations in place to actually guarantee supply for the medical market." 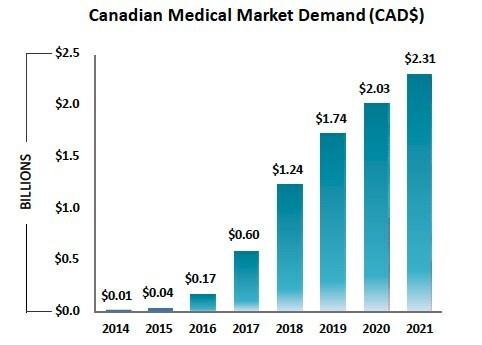 The Canadian medical market is only expected to grow, with forecasts calling for more than $2 billion of spending by the end of 2020. On the pharmaceutical front, as science catches up after years of prohibition, research indicates CBD may have a wide array of health benefits. Companies across the globe are advancing drug candidates to address conditions ranging from seizures to inflammation to cancer. The opportunity is tremendous. For example, Epidiolex, the only FDA-approved CBD drug, to treat a small family of rare illnesses, is estimated to generate $625 million in international annual revenue by 2022. The questions underlying these trends are: Where will all the CBD come from? And more to the point, where will the pure pharmaceutical CBD, manufactured in Health Canada and FDA approved facilities that meet the strictest regulations, come from? Cardiol Therapeutics (TSX: CRDL) is providing these answers. In 2017, Cardiol secured an exclusive agreement with Dalton Pharma Services, which at the time was the one of the very few Health Canada approved and FDA registered companies in Canada licensed to produce pharmaceutical CBD. The program was initially conceived so Cardiol could secure the supply needed to conduct its clinical trial program, with the two companies working together on the formulations required. Following the deal, Dalton's founder, Peter Pekos, took a seat on Cardiol's Board of Directors. Since that initial agreement, the opportunity to manufacture and sell pharmaceutical CBD around the world became clear. Cardiol now has an exclusive global manufacturing agreement with Dalton for the supply of pharmaceutical CBD for commercial introduction. To further boost capacity, Cardiol has engaged in an exclusive supply agreement with Noramco, a global leader in the development and manufacture of active pharmaceutical ingredients. This agreement covers the Canadian and Mexican markets and gives Cardiol a path to significantly scale its production to metric tonnes of CBD per year. By partnering with Dalton and Noramco, Cardiol is assured of the highest quality product manufactured in the most advanced and regulated facilities. Pharmaceutical CBD can provide the material for drug research like Cardiol's existing program. It can be sold on its own to medical patients in legal jurisdictions. It can also be the primary ingredient in any number of CBD products, ranging from edibles to creams, nutraceuticals to pharmaceuticals. Cardiol Therapeutics plans on introducing its pharmaceutical CBD line in H2 2019. The company views this as a significant revenue opportunity that will financially support its clinical research. The clinical trial process is long and fraught with pitfalls, but the rewards are vast in terms of revenue potential. In the meantime, Cardiol Therapeutics is distinguishing itself from other researchers by providing a significant but related revenue stream. Stay tuned.